With the Bookseller Digest blog, you can open and read the newest updates from AbeBooks from any browser, at any time, anywhere. There are several different ways of accessing the blog. You can also subscribe to an RSS feed, which allows you to see the newest updates without having to visit the blog. Open the Bookseller Digest UK blog site. Click on the orange symbol on your Tool Bar. You will see that Bookseller Digest is presented in a slightly different format. Click on the [Subscribe to Feed] button at the top of the screen. Confirm by selecting the [Subscribe] button and the feed will be saved to your favourites list, and will be updated systematically with the newest updates to the blog. You can ensure that more buyers find your books in their search results by optimising the data you use to describe your listings. Remember shopping on the internet is not as easy as in a shop. Buyers have to search for what they want first. You can help them find your books by ensuring you have the information they are looking for in your book descriptions. Keep it book specific - use your book descriptions for book specific information only so that searching buyers can find your titles. Add more information about the content of the book - part of the blurb or a few lines of the introduction - as well as the condition and size. 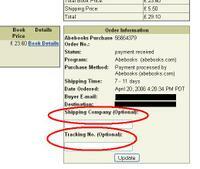 Separate your shipping and store information from the book description itself - Information on shipping and services does not tell the buyer about the book, and is not what a buyer will be looking for when plcaing a search for a book. Avoid the risk of spam mail and computer viruses by removing contact details from your descriptions.To see where best to enter information about your store and shipping terms click here. Do not forget to optimise your keywords - again they should be as book specific as possible. A good tip is to include key terms from the blurb of the book as well as the title. Remember to add foreign keywords and the Glossary of Book Terms to make your books even more accessible to buyers. Be as accurate as possible when describing the condition - you will save on returns for the reason "Item Not as Described". HomeBase 2.3 our free inventory management software can help you to create a structured and comprehensive book catalogue. Each bit of information is separated into fields that allows you to enter the important details of your book in the description making it easier for buyers to identify what they need in your book descriptions. For those who will making the trip to the Frankfurt Book Fair this October, AbeBooks can be found in Hall 4 at stand C 1305, near the Antiquarian Book Fair. We will be at the fair for the full event - October 10th - 14th - and will be very happy to meet any seller who would like to pop by and say hello. We will be holding a booth party on Friday 12th at 5.30pm, with drinks and snacks for those who attend. CEO, Hannes Blum will be there along with members of the European AbeBooks team to meet and greet anyone who wishes to join us. Pop along to the Appledore Book Festival in Bideford, N. Devon this weekend and support a good cause. Profits from the week long book festival go to preservation and upkeep of the local library in Appledore. The library, under threat of closure has now been given the go ahead to remain open on the understanding that they cover the costs of upkeep for the building. The event has been organised to raise the money needed for that. There is a great diary of events, including talks and workshops given by the likes of Kate Adie, who will be speaking about her career and Megan Stallworthy will be giving a workshop on Book Binding. AbeBooks website issues - updated! It has come to our attention that some Internet Explorer 6 browser users may be experiencing issues with using the AbeBooks websites. Please be advised we are investigating the issue and will update you as soon as we have some more news. In the meantime, we have the following details available. Please be advised that for affected sellers the order expiry has been switched off until a solution has been found. Alternatively, you may wish to use download and install another browser - we recommend Firefox. We thank you for your patience and understanding whilst we investigate the issue further. Order Expiry has now been re-activated as the problem has now been identified and fixed. Should you find that you are still having difficulty accessing any part of the site, please contact our Customer Service Team. Did you know that since July this year you are now able to track your parcels from despatch to delivery with Royal Mail tracked. As with all tracking facilities, if you have sent a packet with trackable shipping you can prevent unnecessary refunds from being processed by updating the order with the relevant tracking information. This can be done before and after the order has been processed. Once the tracking number has been provided a claim can be made by either buyer or seller with the relevant shipping company. Please be advised, proof of postage is not the same as proof of delivery. Have you seen the newest Antiquarian Book News? A new website for antiquarian book news has recently been released. Do not forget to add this link to your favourites list so that you are always on top of what is what in the Antiquarian Book world. When accessing the AntiquarianBooksNews.com you will find news and discussion threads, and if you sign up for an account and add the boomarklet that they provide to your favourites list, you can even send in your own stories. If you want to find news on a specific area, you simply use the keyword search to find all the related articles, and the site can also link you to the various associations, for example the Antiquarian Booksellers Association. September 6th - September 11th Only! It turns out that every once in a while you can judge a book by its cover. The striped, retro orange covers that helped make Penguin famous have become universally recognised as a mark of classic literature. Penguin is now reissuing 36 recent bestsellers in the famous design, and we are very pleased to present you with the opportunity to own an entire set of the 14 modern fiction volumes, each signed by the author. AbeBooks and Penguin UK are hosting an online charity auction from September 6th through September 11th during which this one-of-a-kind set will be available to the highest bidder. All proceeds go to English PEN – an international charity devoted to the rights of authors and freedom in literature.